A little history on why I’m suddenly reading books about Con Artists. I had an idea for an urban fantasy series but instead of a standard detective like I’ve been writing with my Jack Story series, I decided to do something more fun; urban fantasy in a Sting/Ocean’s Eleven setting. 2) I needed to learn a lot about cons, con men, and how that all operated. So, for Step 1 I bought the Sting and Ocean’s Eleven. Great movies. Pulling off a heist or con is all in the setup and finding the motivation in their character. Like in the Sting they’re pulling the con in order to get revenge on a mob boss that ordered a hit on Luther, a venerated older con man. Played by James Earl Jones’ father, btw. In Ocean’s Eleven, we don’t find out Danny’s motivation until we’re well into the 2nd act. If the movie has a writing flaw, it’s that one. Oh, they set it up from the very first scene and sort of allude to it in conversation but it should be clearly sooner. But it’s still a dang good heist movie. 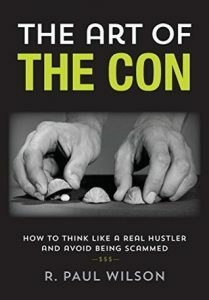 The second- I needed to find books on con artists, cons, and the psychology of cons and the people who pull them. 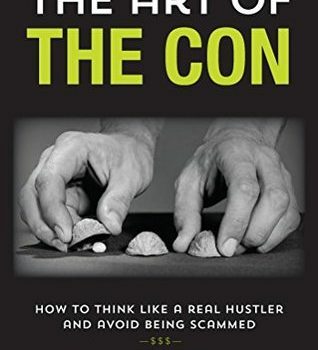 I found this book: The Art of the Con; how to think like a real hustler and avoid being scammed. And I have to say, it’s really good. It’s written by R. Paul Wilson, a man who has studied confidence games his entire life, and has produced, started in, and written TV shows about cons. He breaks down the various types of cons from the short con that happens when someone walks up to you, to the mid game where you’re hooked into a situation, and the “big game” cons that take thousands of dollars from people. Not only does he break some of them down, he runs the reader through how he pulled those exact scams on his various shows. He even gets into the thinking of a con artist. In his view, and I would have to agree with it, that all con artists are motivated singularly by the desire for money. They’re after the money, and they’re ready to do and say whatever it takes to get it. They’ll sacrafice everything- even their relationships- to get more money. And they’ll blame you for letting them get away with it. He also says that he’ll get into why people fall for the cons, but I feel like he’s less successful here. This is why I rate it 4 stars out of 5. He suggests rather than categorically states, that people fall for cons because they’re stupid or greedy, but because manipulated by social expectations and by the con artists. I agree with all of those, but I also think that a fair number of people think they’re smarter than the con that they’re faced with. Like, take 3 Card Monty. You can see that the game is rigged just by watching it for 3 seconds. But it’s easy to think everyone else is a sucker and we’re the one person who can pull this one out. But overall, this is a really good book to read up on cons, how they work, and how the people who pull them think. If you’re looking for a book like that, I recommend this one.